The box makes all the difference: the previous round box has been replaced with a rectangular one. This has one major advantage in particular. The new package saves roughly 3.5 tons of material every year. 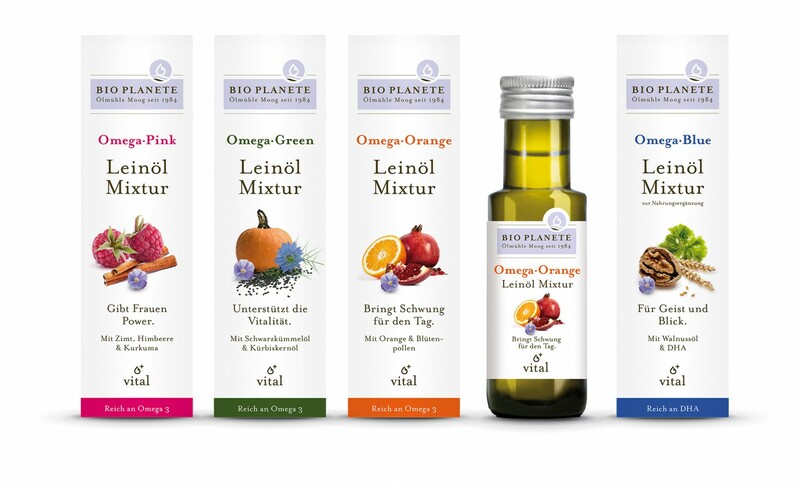 With this relaunch of the Omega Color series, BIO PLANÈTE is taking a clear stand for resource conservation and also guaranteeing the proven quality of its cold-pressed Flaxseed Oil Mixtures. The new rectangular shape of the Vitality Range also takes less space in the shelf, is robust and easy to handle. Reason enough to give the successful range a new look after five years. The Omega Color Vitality Range offers health-conscious customers the right oil for every occasion – whether to kick start their day in the morning, when they have particular nutritional needs or to boost their vitality. One spoon of the Omega Color Oils is an ideal delicious and healthy addition to granola, smoothies, salads, soups and dips. To maximize the positive effects, use the colorful oils daily or as part of a treatment. Visit us on our booth: Hall 7 | 7-617 and try BIO PLANÈTE Omega Color Flaxseed Oil Mixture. We are looking forward to seeing you!